It is very important that a horticulturist strives to maintain uniform and consistent temperatures. 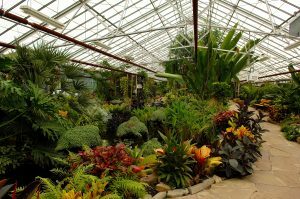 Uniformity of temperature in an indoor garden can be considered part of the temperature’s consistency. Uniformity refers to the garden’s temperature being the same in all areas. Put another way, a uniform garden will have the same (or very similar) temperature from one side of the room to the other. In most indoor gardens, horticulturists utilize high intensity lighting equipment which produces excess heat from one focal point. This can cause a huge variance in the uniformity of temperature within that room. If this is not addressed, the temperature around the light source will be much warmer than other areas of the garden. Maintaining a uniform temperature can normally be achieved by simply creating adequate airflow within the room. In most cases, this can be accomplished by using oscillating fans. Oscillating fans will continuously move the air around the room. This will mix the heated air underneath the light fixtures with the cooler air in the room and create a uniform temperature. Maintaining a uniform temperature is a very important aspect of a garden’s overall consistency and can make a huge difference in a garden’s overall production. It is also extremely important to address the consistency of the actual temperature in the growing area. The better a gardener can maintain a consistent temperature range in his or her garden, the better his or her yields will be. To achieve a high level of consistency, a grower will usually need to invest in a climate controller along with ventilation fans and/or an air conditioner. For ultimate control over temperature, most indoor gardeners choose to use an air conditioner to combat the excess heat of horticultural lighting systems. Mini-split air conditioners have become a valuable tool for indoor horticulturists, allowing maximum control over temperature consistency. Indoor gardeners who invest in a properly sized mini-split air conditioning system will not regret the investment. 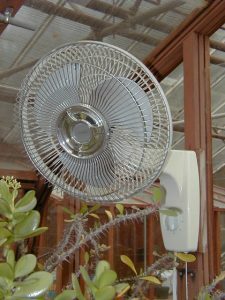 For smaller, hobby-sized gardens, a mechanical fan may be the only cooling device required to maintain a consistent temperature. Most horticultural fans are rated by the CFM (cubic feet per minute) of air they can move. A gardener needs to properly size a fan according to the lighting system’s wattage. A good rule of thumb is to have a minimum of 200 CFM per 1000 watts of artificial lighting. When trying to maximize his or her garden’s efficiency, a gardener should try to determine the garden’s ideal temperature range. The ideal temperature for an indoor garden is the temperature at which plant growth is maximized. The ideal temperature is crop dependent because plants can differ greatly in their responses to temperature. The ideal temperature may also differ from one stage of growth to another. In other words, the ideal temperature range for vegetative growth may not be the ideal temperature range for flowering or fruiting. For most fast-growing annuals, a good initial range at which to operate a garden is 70-80 degrees F. This temperature range can be used as a starting point for both the vegetative stage and the fruiting or flowering stage. From here, a horticulturist can make slight adjustments until the ideal temperature is determined. maintaining a uniform humidity can usually be achieved by the use of oscillating fans. As the plants transpire moisture, a higher humidity is created around the plants. Oscillating fans will move the air around, mixing the lower humidity air with the higher humidity air until a uniform humidity is attained. In some cases, the use of oscillating fans, exhaust fans, and air conditioners aren’t enough to bring the humidity levels down to the desired range. When this happens, a grower can introduce a dehumidifier into the garden’s ventilation system. Most atmospheric controllers have specific outlets for a humidity controlling device. As with temperature, the ideal humidity range for most crops differs from the vegetative stage to the flowering stage. A good starting point for the humidity range in the vegetative stage is 65-75%. Growers should be very careful to avoid high humidity during the fruiting or flowering stage. High humidity levels during the final stages of fruiting or flowering can be an invitation for some devastating pathogens. A good starting point for the humidity during the fruiting or flowering stage is 45-55%. For most indoor gardens or greenhouses, a dehumidifier would only be required during the fruiting or flowering stage of growth. Consistent lighting is not that big of an issue for most indoor gardens and hobby greenhouses. For indoor gardens, annual bulb changes will help keep the light levels of the growing area consistent. For most hobby greenhouse growers, the sun is the sole source of light. However, there are some greenhouse growers who measure light intensity and have artificial lighting systems which can supplement the sun. Some growers use artificial light as a way to extend the length of the day, while others use it as a way to maintain light levels when the sun’s energy is blocked by clouds or other cover. For hydroponic growers, the pH, or potential hydrogen, of the nutrient solution is the most controllable and influential parameter in terms of nutrient absorption. Maintaining consistent pH levels is crucial to maximizing nutrient uptake. Horticulturists who frequently monitor the nutrient solution’s pH will be rewarded with more consistent growth and larger yields. Soil growers have a little more leeway than hydroponic growers, assuming the soil is properly pH balanced. This is because the soil acts as a large pH buffer to the solution. Although each plant species and sub-species has its own optimal pH range for nutrient absorption, a good rule of thumb is to begin with a pH around 5.8 for hydroponic systems and approximately 6.5 for soil. As previously stated, plants thrive on consistency. 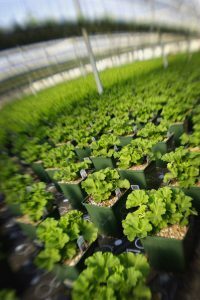 Healthy plant growth depends on temperature, humidity, lighting and nutrient levels staying consistent. When one of these key contributors suddenly falters from the desired range, the plants will usually go into a state of shock or slowed growth. In some cases, the plants will still appear healthy, but the actual rate of growth is hindered significantly. Many horticulturists implement monitoring devices which can alert them of any sudden changes in the garden. The quicker a gardener can correct a deviation in consistency, the faster the plant will return to an accelerated rate of growth. Just about anyone can throw some seeds in the soil and wait for a plant to grow. For serious horticulturists, growing plants is more than just giving them the bare essentials to survive. Horticulturists who take pride in their work and/or those gardeners who want to get the largest return on their investment want to see their plants thrive. Not only is it important to provide a garden with lighting, ventilation, and nutrition, but also to do so in a manner that maximizes plant growth. The most effective way to do this is to provide each of the vital factors of plant growth in the most consistent way possible. Horticulturists who take the time to find the crop’s optimal temperature and humidity range will be more able to dial in the garden’s atmospheric conditions and make it more conducive for accelerated growth. Providing plants with a constant light source and a balanced nutrient solution at the proper pH, increases the likelihood of success. Each contributing factor of success influences a portion of the chemical equation we know as photosynthesis. When atmospheric conditions, lighting and nutrition are consistent, the garden will encounter less problems and the crop being grown will be able to produce up to its full potential.